First, a disclaimer: These cookies are, well, a little weird. I have a problem: I get my dried herbs and spices really cheaply. Our farmer’s market sells bulk herbs and spices, which means I get four ounces of ground ginger for 60 cents. The problem is: I have huge amounts of lesser-used spices piling up on my shelves. Sure, I can use up four ounces of thyme in no time (sorry, couldn’t resist) but file powder? Just how much gumbo can one family eat? So that’s what motivated me to try to think of something different to do with file powder–why not cookies, right? OK, I agree it sounds a little strange, but why not experiment? Our first step was to come up with a flavor profile for the cookies. I set up a big cutting board with three little piles of file powder, then added clove to the first, ginger to the second, and clove and ginger to the third. 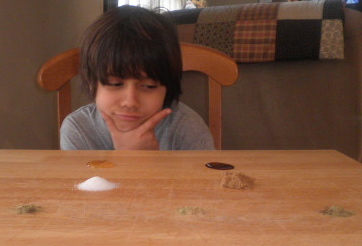 Next, I put down two piles of sugar: one white and one dark brown. Finally, I dolloped out a tablespoon each of molasses and honey. clove & file x brown sugar vs. clove, ginger & file x white sugar. Whip the butter and sugar until airy. Add the egg and beat. Add the molasses and combine until smooth. Mix together your dry ingredients, then add to your wet, combining with a wooden spoon or spatula. Once you have a dough (it will be pretty wet, given the butter/sugar ratio here), form a ball and wrap in plastic. Place in the fridge for at least 45 minutes. Preheat your oven to 350 degrees. 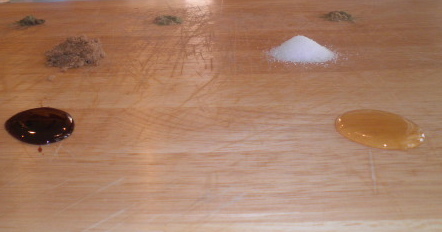 Once your dough has set up, slice off pieces and roll into 1″ balls. Place the balls on a cookie sheet lined with parchment paper, with about 3″ between them. Flatten to just under 1/2″ by pushing down (criss-cross) on the balls with a fork twice. Back for 13-14 minutes. Let them cool for a couple of minutes before transferring them off the parchment paper and onto a cooling rack. So were Swamp Cookies a success? Given how much fun Josh and I had experimenting in the kitchen, I would say most definitely. This entry was posted in Uncategorized and tagged baking, cookies, dessert, experiments. Bookmark the permalink. You won’t believe this! We just made snickerdoodles. For Adam’s Valentine’s Day celebration at school! Too bad I didn’t see this recipe before the big day. Or maybe that’s a good thing. I love the process most of all. Great fun! 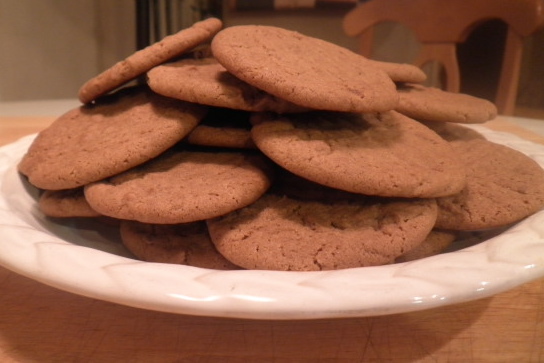 Yeah, they are a bit peculiar–although on second taste, Matthew has declared the cookies “strangely addictive.” Maybe I should double-check the chemical properties of sassafras leaves! Love how you worked out the spice selection. We will definitely give them a try. It’s really fun–and informative–to work through how different tastes play off of each other. Next time I do make gumbo, I will probably hit it with a bit of clove. I have put clove in my chili — just a hint… It gives it a zing. Also dearest Prajna has a wonderful red lentil and ginger recipe that I served to my folks yesterday. The ginger is always a hit. Ginger’s a great example of a spice that changes radically between fresh and dried. I have to be really careful with dried ginger or my younger palates will declare the dish too spicy (which is why I never put ginger in my masala chai). I never get that reaction when I use fresh ginger in a dish. I’ll have to ask Prajna for that red lentil recipe!